"This is a wonderful sweet and hearty bread. It goes great with a bowl of soup on a winters day, or plain with a little butter. It is the easiest bread recipe you will ever make and I can't eat enough of it." In a large bowl, stir together all-purpose flour, whole wheat flour, sugar and salt. In a separate bowl, dissolve baking soda in buttermilk. Stir buttermilk into flour mixture. Beat well. Pour batter into prepared pans. Bake in preheated oven for one hour. You’ll love Chef John's twist on this holiday quick bread. 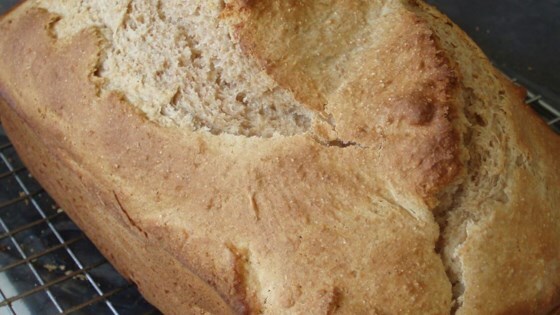 A hearty bread which is very easy to make. I found it a little too sweet; next time I'll use less sugar. Very easy to make and delicious! A real winner. I will definately make this one again. I have five kids ages 1 through 10 and they absolutely loved it! My husband and I also enjoyed it very much. Different, but good. Tastes alot like sweetened cornbread. I would make it again. Followed the recipe as written.